Marcus Aurelius was born to a prominent and established family, but nobody at the time would have predicted that he would one day be Emperor of the Roman Empire. The emperor Hadrian was nearing death and chose Antoninus as his successor, with the condition that he adopt Marcus. And in 161, Marcus became the Emperor and ruled for nearly two decades until his death in 180. The guidance of wisdom and virtue. That’s what separates Marcus from the majority of past and present world leaders. Just think of the diary that he left behind, which is now known as his Meditations: the private thoughts of the most powerful man in the world, admonishing himself on how to be more virtuous, more just, more immune to temptation, wiser. Those thoughts are now a landmark of Stoic philosophy that have guided some of history’s greatest men and women. For good reason. In his wonderful book The Captain Class, Sam Walker, a deputy editor at the Wall Street Journal, looks at the unsung leaders who have taken their teams on incredible championship runs. His book celebrates captains, not All-Stars, or the highest-paid players, or the most famous players—though a captain may be all those things. In his view, a captain is the kind of athlete who does the right thing to help their team and their teammates, whether they get credit for it or not. Because it’s the right thing to do. Have you ever heard someone else repeat one of your ideas as though it were their own? Did you ever notice a younger sibling or relative mimic your behavior, perhaps the way you dress or the music you listen to? Maybe you moved to a new neighborhood and a bunch of hipsters followed. When we are young and inexperienced, we can react negatively to these situations. Stop copying me! I was here first! As we mature, we start to see them in a different light. We understand that stepping up and helping is a service that leaders provide to the world. It’s our duty to do this—in big situations and small ones. If we expect to be leaders, we must see that thankless service comes with the job. We must do what leaders do, because it’s what leaders do—not for the credit, not for the thanks, not for the recognition. It’s our duty. What we see in the writings of the Stoics is that they strove to ensure that their ambition never corrupted their self-awareness. We rarely see ego and self-glorification in their pages, in fact, we usually find the opposite: meditations on how to improve, reminders that they were still human and flawed. Take someone like General William Tecumseh, a true American hero who is sadly and wrongly vilified in popular history. What we find in Sherman—a man who was not explicitly Stoic but certainly embodied the Frontier American Stoicism of his time—is someone who was deeply tied and connected to reality. He was a man who came from nothing and accomplished great things, without ever feeling that he was in some way entitled to the honors he received. In fact, he regularly and consistently deferred to others and was more than happy to contribute to a winning team, even if it meant less credit or fame for himself. This notion of poise and not pose, ambition without entitlement, self-study without self-obsession is in a way the essence of Stoicism. It’s a model for us to follow, especially those of us who want to have impact on this world. Who would you rather be, Napoleon or Sherman, Alexander or Marcus Aurelius? And who do you think lived a better life? Especially when that calm is coming from the man or woman in charge. If the men begin to lose their wits, if the group is unsure of what to do next, it’s the leader’s job to do one thing: instill calm—not by force but by example. That’s who you want to be, whatever your line of work: the casual, relaxed person in every situation who tells everyone else to take a breath and not to worry. Because you’ve got this. Don’t be the agitator, the paranoid, the worrier, or the irrational. Be the calm, not the liability. How often do we begin some project certain we know exactly how it will go? How often do we meet people and think we know exactly who and what they are? And how often are these assumptions proved to be completely and utterly wrong? This is why we must fight our biases and preconceptions: because they are a liability. Ask yourself: What haven’t I considered? Why is this thing the way it is? Am I part of the problem here or the solution? Could I be wrong here? Be doubly careful to honor what you do not know, and then set that against the knowledge you actually have. Remember, if there is one core teaching at the heart of this philosophy, it’s that we’re not as smart and as wise as we’d like to think we are. If we ever do want to become wise, it comes from the questioning and from humility—not, as many would like to think, from certainty, mistrust, and arrogance. Why do athletes talk trash to each other? Why do they deliberately say offensive and nasty things to their competitors when the refs aren’t looking? To provoke a reaction. Distracting and angering opponents is an easy way to knock them off their game. Try to remember that when you find yourself getting mad. Anger is not impressive or tough—it’s a mistake. It’s weakness. Depending on what you’re doing, it might even be a trap that someone laid for you. Fans and opponents called boxer Joe Louis the “Ring Robot” because he was utterly unemotional—his cold, calm demeanor was far more terrifying than any crazed look or emotional outburst would have been. Strength is the ability to maintain a hold of oneself. It’s being the person who never gets mad, who cannot be rattled, because they are in control of their passions—rather than controlled by their passions. Inherent in the Stoic concept of sympatheia is the notion of an interconnected cosmos in which everything in the universe is part of a larger whole. Marcus Aurelius was one of the first writers to articulate the notion of cosmopolitanism—saying that he was a citizen of the world, not just of Rome. Just because something is bad for you doesn’t mean it’s bad for everyone. Just because something is good for you definitely doesn’t mean it’s good for everyone. Think of the hedge fund managers who bet massively against the economy—they profited by rooting for essentially everyone and everything else to fail. Is that who you want to be? A good Stoic, like a good leader, understands that proper impulses, and the right actions that arise from them, naturally carry the good of the whole, which is the wise person’s only good. Conversely, good and wise actions by the whole are what’s good for the individual. A sign on President Harry Truman’s desk read, THE BUCK STOPS HERE . As president, with more power and control than pretty much anyone else, he knew that, good or bad, there wasn’t anyone he could blame for stuff other than himself. There was no one to pass the buck to. The chain ended there, in the Oval Office. To be a great leader—and knowing that our powers begin and end with our reasoned choice—we would do well to internalize this same attitude. We don’t control things outside that sphere, but we do control our attitudes and our responses to those events—and that’s plenty. It’s enough that we go into each and every day knowing that there is no one to pass the buck to. It ends with us. On tough days we might say, “My work is overwhelming,” or “My employees are really frustrating.” If only we could understand that this is impossible. Someone can’t frustrate you, work can’t overwhelm you these are external objects, and they have no access to your mind. Those emotions you feel, as real as they are, come from the inside, not the outside. The Stoics use the word hypolêpsis, which means “taking up”—of perceptions, thoughts, and judgments by our mind. What we assume, what we willingly generate in our mind, that’s on us. We can’t blame other people for making us feel stressed or frustrated any more than we can blame them for our jealousy. The cause is within us. They’re just the target. It is difficult even to conceive of what life must have been like for Marcus Aurelius—he wasn’t born emperor, nor did he obtain the position deliberately. It was simply thrust upon him. Nevertheless, he was suddenly the richest man in the world, head of the most powerful army on earth, ruling over the largest empire in history, considered a god among men. It’s no wonder he wrote little messages like this one to remind himself not to spin off the planet. Without them, he might have lost his sense of what was important—falling prey to the lies from all the people who needed things from him. And here we are, whatever we happen to be doing, at risk of spinning off ourselves. When we experience success, we must make sure that it doesn’t change us—that we continue to maintain our character despite the temptation not to. Reason must lead the way no matter what good fortune comes along. The opposing team comes out strong, establishes an early lead, and you never had time to recover. You walk into a business meeting, are caught off guard, and the whole thing goes poorly. A delicate conversation escalates into a shouting match. You switched majors halfway through college and had to start your coursework over and graduate late. Sound familiar? It’s the chaos that ensues from not having a plan. Not because plans are perfect, but because people without plans—like a line of infantrymen without a strong leader— are much more likely to get overwhelmed and fall apart. The Super Bowl-winning coach Bill Walsh used to avoid this risk by scripting the beginning of his games. “If you want to sleep at night before the game,” he said in a lecture on game planning, “have your first 25 plays established in your own mind the night before that. You can walk into the stadium and you can start the game without that stress factor.” You’ll also be able to ignore a couple of early points or a surprise from your opponent. It’s irrelevant to you—you already have your marching orders. Don’t try to make it up on the fly. Have a plan. “For I believe a good king is from the outset and by necessity a philosopher,” Musonius Rufus siad, “and the philosopher is from the outset a kingly person.” The Israeli general Herzl Halevi believes that philosophy is essential in his role as a leader and warrior. “People used to tell me that business administration is for the practical life and philosophy is for the spirit,” he said. “Through the years I found it is exactly the opposite— I used philosophy much more practically.” War and leadership offer an unending series of ethical decisions that require priorities, balance, and clarity. That’s what philosophy helps with. Plato knew this when he imagined a utopia ruled by a philosopher king. 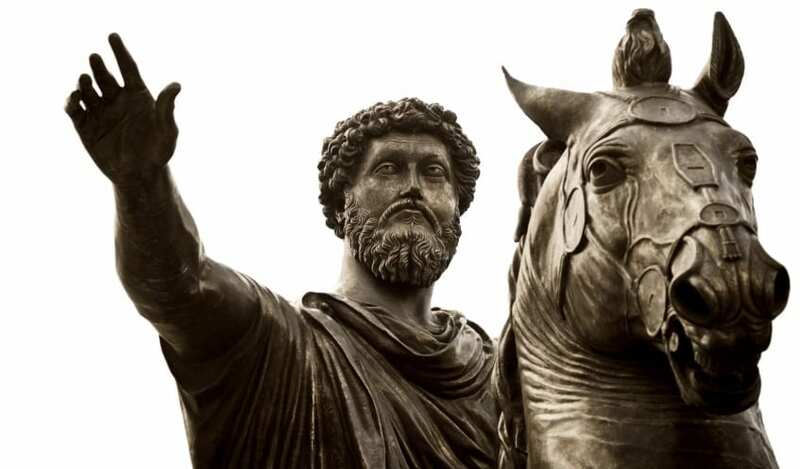 “Either philosophers should become kings,” he said in The Republic, “or those now called kings should truly and sufficiently undertake philosophy.” Marcus Aurelius was quite literally that philosopher king. What does that have to do with you? There are fewer kings these days, but we’re all leaders in one way or another of families, of companies, of a team, of an audience, of a group of friends, of ourselves. It’s the study of philosophy that cultivates our reason and ethics so that we can do our job well. We can’t just wing it—too many people are counting on us to do it right.